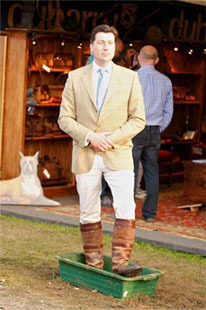 So last weekend at the Burghley Horse Trials Dubarry 's stand was heaving with customers and Dubarry sales people handing out champagne. At £299 a pair of boots they will have taken thousands and thousands of £££'s. just what was the sales person thinking when he was given the golden opportunity to increase the value of his sale? In all honesty he shouldn't have to have been asked about care he should have told his customer and suggested products without prompting. Now there is a lesson to be learned here by all you folk out there with equestrian businesses, maximise your sales!